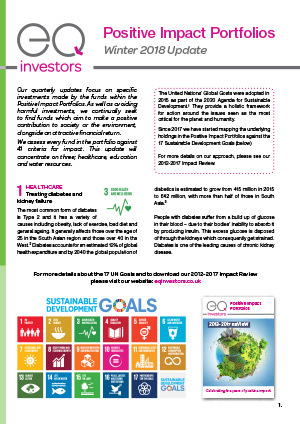 Our quarterly update focuses on specific investments made by the funds within the Positive Impact Portfolios. With this update we focus on healthcare, education and water resources. Our quarterly update focuses on specific investments made by the funds within the Positive Impact Portfolios. As well as avoiding harmful investments, we continually seek to find funds which aim to make a positive contribution to society or the environment, alongside an attractive financial return. The United Nations’ Global Goals were adopted in 2015 as part of the 2030 Agenda for Sustainable Development. They provide a holistic framework for action around the issues seen as the most critical for the planet and humanity. Since 2017 we have started mapping the underlying holdings in the Positive Impact Portfolios against the 17 UN Sustainable Development Goals: for more details on our approach please see our 2012-2017 Impact Review.